What struck me first and foremost about this conference was Melanie Ariens’s art. It was on display and hanging in the window in the long entrance way of Discovery World. Expanding on her metaphor, hanging there in the window was the familiar, her blue jean baby. Recycled, maybe a little worse for wear, but still functional, indeed vital for life. Patched and rough edged, the shape spoke to me in subtle shades of blue. 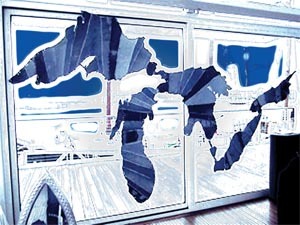 Our Great Lakes, Michigan, Superior, Huron, Erie and Ontario, were stretched across the span of window behind her. Lake Michigan itself was in the background with the schooner S/V Denis Sullivan floating placidly at the dock. Her art reminds us of the concerns about water as well as the beauty of the Great Lakes. Are the lakes hanging by a thread? In dire stitches? Read more on Melanie’s art and the wonderful Redline Gallery on page 12. But read on to explore some issues the water conference addressed. Discovery World is the ideal location for a water conference. It sits on the lake with great views of the subject at hand. The museums displays are fun, engaging and informative, particularly in regards to water. Weigh yourself and find out how much of your weight is water. How do sewers work? How do we save water? There is the best model of the Great Lakes with its own thundershower and elevations that show the relationships between the lakes as they flow toward the North Atlantic. Can you find Niagara Falls? Don’t miss the aquarium downstairs. It is not the biggest but the fish tunnel is amazing. Walk the decks of the schooner hanging between floors. You can excuse me if I came late for a presentation. The place is fun to explore. Dr. Frank spoke on Sweet Water’s collaboration efforts since its inception in 2009. Looking for cooperation based on the watershed model is a key focus for the group. Partnering with the federal EPA and the state WDNR is vital for progress. Dr. Hedman spoke on federal initiatives associated with the Great Lakes. Working with partners on outreach. Cathy Stepp emphasized the WDNR’s role in enforcement of rules and environmental regulations and the need to fill positions within the state agency. She said that many vacant positions are now being filled. There were presentations from the state, city and a private developer on our water resource. They pointed out that, of course, tourism is a vital industry for much of our state. We are blessed with abundant water resources and this generates a lot of jobs for our citizens. Industry relies on water in many ways and Milwaukee has it. Brewing beer here is not a chance happening. Access to fresh water was key. Changing the paradigm from exploitation of resources to restoration of our environment’s vitality is the goal for sustainable industry. And use while restoring is the goal for sustainable rivers and lakes. Robert Monat, Chief Operating Officer from the Mandel Group, knows well the value of real estate along and near waterways. Mandel Group has specialized in repurposing and developing brown field (soil contaminated) sites. Monat raised an interesting proposal. The Milwaukee River flows through our downtown and the river used to be the main transportation channel all the way up to Humboldt Blvd. The bridges across the Milwaukee open to allow ships to pass. Even the Holton Street Bridge used to open. It costs a lot of money to maintain these bridges as opening structures. Monat said that cost to the city might not be the best investment. His proposal: put the money that would be spent to keep these bridges as opening structures aside for public improvements along the riverwalk and riverbanks. In other words make them fixed bridges that are much less costly to maintain. Seen many ships moving north of Wisconsin Avenue lately? The conference in general appeared to me to have a stronger focus on the economic benefits of water for business and real estate, including manufacturing, retail business near water, residential developments with frontage and views of water. This may be a sign of tough economic times, politics in Madison and Washington as well as Milwaukee and the realities of urban living. The positive aspect of this focus may be the creation of a common vision that takes the factual information provided by scientific study and combines it with business, community and government to find a path that preserves and protects our water for generations. The breakouts covered many topics. An overview can give a feeling of what seems to be important to the community at this time. Rainwater and how we deal with it has been and continues to be an important focus. In sum: catch it, save it, slow its flow down where you can. Water used to be seen as something to get rid of as fast as possible on urban land. This resulted in paved cities with runoff going into sewers and sent to streams that may have been channelized to increase flow rates. Urban growth and faulty design has led to flooding. The movement of storm flows into rivers results in flooding when you reach a point downstream where the river or creek cannot handle the volume. The Kinnickinnic and Menomonee Rivers are prime models of this design process. When it rains and sewers back up into basements people really start becoming concerned. To mitigate this there were presentations on architecturally designed rainwater collection systems, bulk tanks, rain barrels and rain gardens. On a larger scale Walnut Way Conservation Corps is working with Milwaukee Metropolitan Sewerage District on a 37-block city neighborhood to develop and test a model of best management practices for urban storm water retention through the installation of 50 rain gardens. The City of Milwaukee is working in a targeted neighborhood to reduce infiltration and inflow of rainwater into sanitary sewers. This inflow of clean water is seen as a major cause of sanitary sewer overflows into our streams. Rainwater coming in also adds greatly to the cost of sewerage treatment by adding increased volume at the treatment plant. The project includes the installation of a lining in the sewers and laterals to homes in order to eliminate or minimize inflow of rainwater. Installation is scheduled to begin in May of 2012. One interesting breakout was on winter road salt and its impact and proper use to minimize ecological damage. Sound a little boring? Let’s hope the Milwaukee’s DPW and city leaders didn’t think so. Milwaukee reportedly uses much more salt on roads in winter than Madison does. Maybe that should change. The subject can get deeply technical quickly but Connie Fortin of Fortin Consulting from Minneapolis gave a clear and easy-to-understand example. Take a jar and fill it with clean tap water and then add two tablespoons of salt and stir, the salt dissolves in the water. Put the cover on the jar and put it on a shelf. Come back in twenty years. You have a jar of salty water. The point being once you add the salt it does not go away. Ever. Of course, streams are always renewing themselves with every rain. Small lakes have water turnover of various time frames depending on the source of water and size of the lake. The problem with road salt and streams and inland lakes is the influx of large volumes of salt during certain times of the year. This can result in fish kills and degradation of the water habitat. The Milwaukee Journal Sentinel reported in 2008 that scientist Steve Corsi said the findings of chloride concentrations exceeded the EPA’s toxic standard of 850 parts per million on the Kinnickinnic, Menomonee and Root rivers and on Honey, Underwood, Lincoln and Little Menomonee creeks. On Feb. 26, 2007, at Honey Creek in Wauwatosa, chloride levels essentially became saline water for a few hours, hitting 6,470 parts per million. By contrast, Corsi used Parnell Creek in the Kettle Moraine State Forest as a control stream. He found it was not affected by road salt and registered 20.4 parts per million. What about Lake Michigan? Fortin did not have an answer to that question. The turnover of the water in Lake Michigan is said to be 100 years. Although the level of salt in our lake is not above what is considered acceptable levels, it is rising. An audience member at the conference said the salinity of Lake Michigan has risen 40% in the last ten years. The Milwaukee Journal Sentinel 2008 story listed the increase in salinity from inflow from the watershed into Lake Michigan, by more than a third since 1983, though still well below acceptable levels, according to the US Environmental Protection Agency. We probably have a way to go before we have a Salton Sea but it may be time to start paying closer attention. Artist Melanie Ariens calls us “freshwater spoiled brats.” Our Lake sits 577 feet above sea level. We are safe from global warming ocean rise. The Great Lakes hold 20% of all the open fresh water in the world. Even though we can only use about 1% a year, which is the refresh rate, that still is a vast resource. Our Wisconsin land has more inland lakes than Minnesota. We have many rivers and streams. Ground water may be dropping but is still there. Oh lucky man and woman. 1. MIND THE TAP • Try to use less water when it’s raining. 2. DISCONNECT • Direct downspouts into rain barrels, yard or garden instead of the sewer and driveway. 3. SCOOP THE POOP • Clean up after your pets (and don’t feed the water fowl). 5. FIX A LEAK • Check toilets and faucets for leaks: a leaky toilet can waste 200 gallons a day! 6. TAKE A TEST • Test your soil before you fertilize. 7. DON’T BE A DRIP • Inspect your car regularly to stop oil and fluid leaks. 8. GIVE YOUR RAKE A BREAK • Leave grass clippings on your lawn. 9. LET IT GO • Mow your lawn less frequently set the blade to three inches. 10. WASH CAREFULLY • Take your car to a carwash, or wash it on your lawn.